But we just got the first Fonepad! When Asus comes to town, it goes to town. There was a whole sleuth of new products announced at IFA today, including a refresh of the Fonepad. Asus set the original FonePad live at MWC just six months ago but it's already giving the device an update with a new glossy rear cover and extra speaker on the front - and named it the Fonepad 7. Other than that, there's not much new to write home about. The tablet comes with a 7-inch HD 1280 x 800 display and offers voice calling and 42Mbit/s download speeds. It's also powered by an Intel Atom Z2560 processor. And just ahead of Samsung's Galaxy Note 3 unveiling, Asus offered up its own alternative by going official with the Fonepad Note 6. 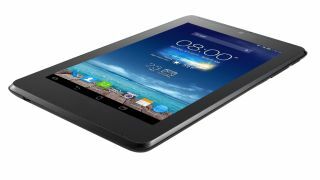 The 6-inch Android tablet packs a Full HD Super IPS+ display with both multi-touch and stylus inputs. It's also powered by the new Intel Atom Z2580 processor clocked at 2Ghz. Meanwhile there's HSPA+ and 3G to keep you connected. On the back is an 8MP camera and the phablet comes with either 16GB or 32GB of storage. Android 4.2.2 for this one. And if that wasn't enough, Asus then announced the Memo Pad 8 and Memo Pad 10. While different in size, both Android tablets offer 1280x800 resolution displays and quad-core processors. The Memo Pad 8 (named after its 8-inch screen, of course) comes in an 8GB model with a 5MP rear camera and 1.2MP front-facing snapper. The 10, meanwhile, comes in 8GB and 10GB versions and has a 10-inch display. Looks like those looking for a pocket-friendly budget tablet might find something decent in the Memo Pad 8 when it rolls around.